Social Media Contest for CFS Families and Staff! Opportunity to win up to $550 towards tuition credit for the current school year! 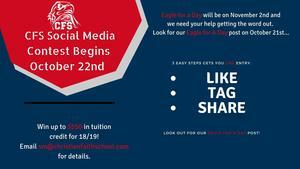 From October 22nd through October 26th we are hosting an online, social media contest for our families and staff. Step 3. Share our post with the #CFSEagleForADay on your personal social media feed. Pretty simple! If you complete all 3 steps, you will get one raffle entry into our drawing for a chance to win $300 towards the current year's tuition. 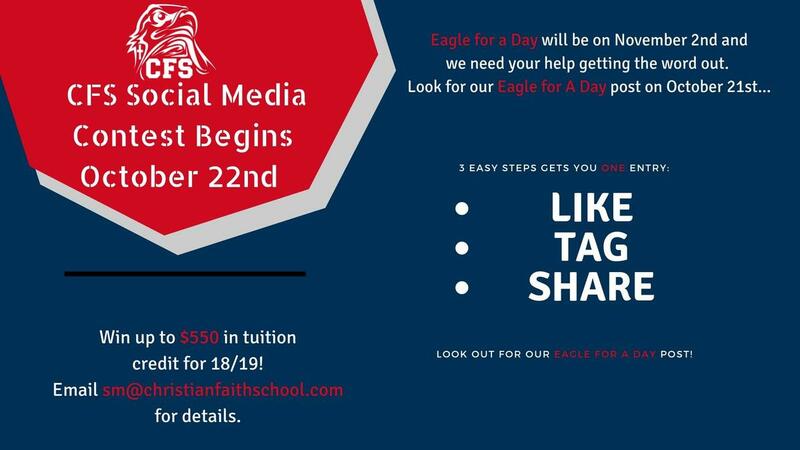 Also, if you refer someone to be an Eagle For A Day and they enroll into CFS by 4 PM on November 9th, you get a $250 referral credit! We are so excited about this contest! Look for our EAGLE FOR A DAY post with the #CFSEagleForADay and complete the 3 steps for a chance to win!